The aorta is the largest artery (blood vessel) in the body. It carries blood from the heart and runs down through the chest and the abdomen (belly). Many arteries come off the aorta to supply blood to all parts of the body. At about the level of the pelvis the aorta divides into two iliac arteries, one going to each leg. An aneurysm occurs when the wall of a blood vessel weakens and balloons out. In the aorta this ballooning makes the wall weaker and more likely to burst. 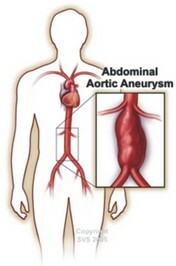 Aneurysms can occur in any artery, but most commonly occur in the section of the aorta that passes through the abdomen. These are known as abdominal aortic aneurysms (AAA). The exact reason why an aneurysm forms in the aorta is not clear in most cases. Aneurysms can affect men or women of any age. However, they are most common in men, people with high blood pressure (hypertension) and those over the age of 65. The wall of the aorta normally has layers of supporting tissues. As people age, they may lose some of this tissue. This is thought to explain why aneurysms are more common in older people. Your genetic make-up plays a role as you have a much higher chance of developing an AAA if one of your immediate relatives (parent, brother or sister) has or had one. Other risk factors that increase the chance of getting an aneurysm include: smoking, high blood pressure, high cholesterol, emphysema and obesity. It is estimated that about four in 100 men over the age of 65 will develop an abdominal aortic aneurysm, though not all will be of significant size, and about one in 100 will have a large aneurysm requiring surgery. They are about six times rarer in women. The NHS AAA Screening Programme screens men aged 65 and over. Screening is performed using an ultrasound scan of the abdomen. This is a quick and painless test and is similar to the scans done on pregnant women to show a picture of their baby. The scan shows if there is an aneurysm present and how large it is. Men are given their result straight away. The majority of AAAs cause no symptoms and are discovered by chance. A routine examination by a doctor or an X-ray or scan performed for some other reason may pick up the presence of an aneurysm. In some cases, patients notice an abnormal pulse in their abdomen. As the aneurysm stretches it can also cause pain in your back or abdomen. Men are invited for screening during the year they turn 65. Men over 65 who have not previously been screened can contact their local screening centre direct to organise a scan. The NHS AAA Screening Programme is being introduced gradually to make sure it works as effectively as possible.Visit aaa.screening.nhs.uk whereyoulive for details of where screening is available and for contact details for the local screening programmes. By 2013 screening will be offered to all men in England in their 65th year. Aneurysms generally take years to develop and it is rare for them to give symptoms during this time. Do I need an operation to treat my aneurysm? Research has shown that for people with AAA measuring less than 5.5cm (about 2 inches) it is safer not to operate as the risks of having an operation are greater than the benefit. If your surgeon recommends an operation, they will give you more information. You can also find more details of these procedures in our other sections. Why do I need to have my aneurysm checked regularly? The larger your aneurysm becomes the more chance there is of it causing serious problems. Most abdominal aortic aneurysms occur in the lower end of the aorta. In this position they can get bigger without causing any symptoms. Most aneurysms grow slowly at a rate of about 3mm (1/8 inch) per year. However, larger aneurysms are more likely to grow quickly so scans are done more frequently as the AAA enlarges (See reference 1 below). If an AAA gets bigger there is an increased risk that it may leak or rupture (burst) without any warning. What is the chance of a small AAA rupturing? The chance of rupture is very low for small AAA. For aneurysms measuring less than 5.5cm in diameter the risk of rupture is less than one in 100 per year (See reference 1 below). As aneurysms get larger than 5.5cm, the risk of rupture increases and it is usually at this size that the option of surgery is considered. For any given size, rupture risk is increased in smokers, those with high blood pressure, and those with a family history of an AAA. Each individual’s risk from their AAA and from surgery may be different so any decision on treatment will be carefully considered by the vascular team and always discussed in detail with you and, when appropriate, your family. Do I need to take things easy? If you have been told you have an aneurysm, there is no need to limit your everyday activity. Moving around, lifting and exercise will not affect your aneurysm or cause damage. What do I do if I get new symptoms? If you experience sudden onset of new severe abdominal pain or back pain that is distinct from any back pain you may have had previously, you may be developing a leak from your AAA or it may be at immediate risk of rupture. If you experience any of these symptoms you should dial 999 for an ambulance and tell the ambulance control that you have an abdominal aortic aneurysm and need to go urgently to hospital. Do not drive yourself to hospital. Smoking. If you are a smoker the single most important thing you can do to help yourself is to give up smoking (see reference 2 below). Stopping smoking will also help to protect all of your arteries making it less likely that you will suffer from heart attacks or strokes. Giving up is not easy but there is a smoking cessation service and support groups that can help. Your vascular specialist nurse or GP practice nurse can advise you about these. Inactivity. Gentle exercise such as walking and cycling are recommended to help to improve your overall level of fitness. Exercise helps your body to produce healthy cholesterol and this helps to protect your arteries against bad cholesterol. High blood pressure. High blood pressure is a known risk factor for rupture of aneurysms. It is very important that you have your blood pressure checked regularly, at least every 6 months (see reference 3 & 4 below). If you have been prescribed medication for high blood pressure, you must make sure that you take it according to the instructions given. Diabetes. If you have diabetes it is important that your blood sugar levels are well controlled. High blood cholesterol levels (fatty substance) in your blood. You should eat a healthy balanced diet and try to reduce any excess weight. It is important to reduce the level of cholesterol in your blood: you will be given advice on how to do this. Your vascular nurse can refer you to a dietician if needed. You may be prescribed a statin drug to lower your cholesterol level and low-dose aspirin to help prevent blood clots from forming. If you have a small AAA (<5.5cm) you are allowed to continue to drive. The DVLA should be notified if your aneurysm reaches 6cm in diameter and you are allowed to continue to drive if you have had satisfactory medical treatment and there is no further enlargement of your AAA. If your AAA reaches 6.5cm in diameter you are disqualified from drivin (see reference 5 below). HGV drivers are disqualified from driving if their AAA is >5.5cm, but can resume driving if AAA is successfully treated (see reference 5 below). If you have any questions or queries you can contact the Vascular Practitioners/Nurse for your area or alternatively the secretary for your Consultant. NB: Your surgeon will advise you on the basis of a CT scan whether it is possible to perform Endovascular Aneurysm Repair (EVAR) surgery. In some cases this is not possible and, if fit enough, you will be offered a more traditional ‘open’ operation. 1. The UK Small Aneurysm Study Participants. “Mortality results for the randomised controlled trial of early elective surgery or ultrasonographic surveillance for small abdominal aortic aneurysms.” Lancet 1998; 352:1649-55. 2. DOH Smoking kills. A white paper on tobacco. The Stationery Office, London, December 1998. 3. Kannel WB, Dawber TR, McGee DL. Perspectives on systolic hypertension. The framington study. Circulation 1980; 61; 1179-1182. 4. Stamler J, Stamler R, Neaton JD. Blood pressure, systolic and diastolic and cardiovascular risks. US population data. Archives of internal medicine 1993; 153; 598-615. 5. For Medical Practitioners. At a glance guide to current Medical Standards of fitness to drive. Drivers Medical Group, DVLA, Swansea. August 2010. Whilst we make every effort to ensure that the information contained on this site is accurate, it is not a substitute for medical advice or treatment, and the Circulation Foundation recommends consultation with your doctor or health care professional.